Eagle Carriage & Machine Inc. Since 1977, Eagle Carriage & Machine Inc. has been setting the standard for reliability, resilience and quality when it comes to manufacturing skyline carriages for the logging industry. 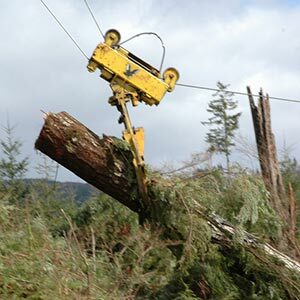 Our products serve logging companies worldwide and thanks to our superior engineering, none of our products has ever needed improvement by its owner. Why Choose Eagle Carriage & Machine Inc. in La Grande? At Eagle Carriage & Machine Inc., we emphasize quality and durability above all else, creating products that are not only safe, but resilient and high-functioning for years to come. As a world leader in the production of skyline carriages from La Grande, OR, we take our commitment to our craft and our customers to heart, never compromising security for weight savings. And, for more than 35 years, we have been proud to tell our customers that a product that bears our name is one that they can have complete faith in. We serve the entire United States and Canada. We are a member of the National Federation of Independent Business, Washington Contract Loggers Association and National Chamber of Commerce. Our products are globally recognized as leaders in quality. Our carriages are comprised of T1 steel, low-pressure hydraulics and single solenoid valves. We can custom design front bumpers for both Dodge and Ford trucks. Looking for manufacturing that you can put your trust in? Whether it’s a skyline carriage for your lumber operation or a high quality bumper for your rugged truck, we can help.